for O&C counties by clear-cutting 23,000 acres annually. 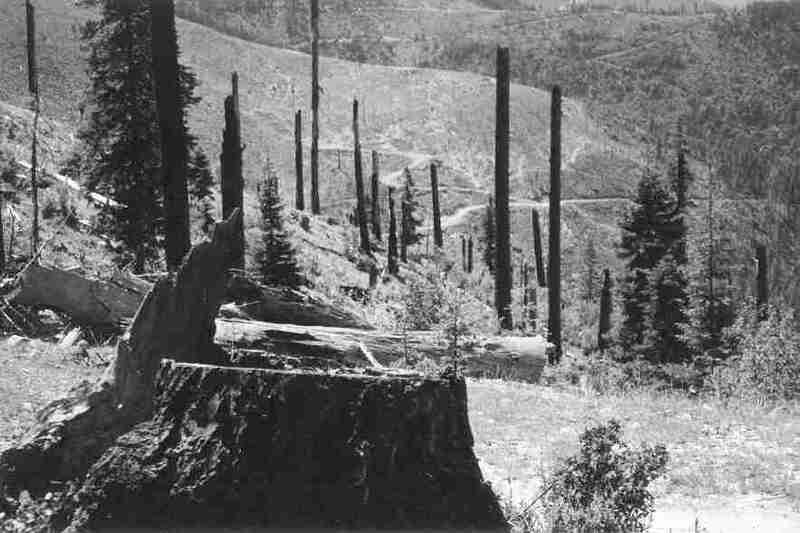 the controversial logging prescriptions mis-named "Ecological Forestry"
showcased in the Pilot Joe and other pilot projects on BLM lands. any time new information warrants adaptation and changes in EF. Sterling Mine Ditch Trail system, over 30 miles of accessible hiking trails. Wellington and Mungers Buttes in the Applegate, and Grizzly Peak near Ashland. clearcutting of B.L.M. forests in the Applegate. this anti-environment legislation does not become law. Read on! introduced inthe U.S. House, and by legislation introduced in the Senate by Oregon Senator Ron Wyden. a fire-prone homogenous tree plantation under the rules of the Oregon Forest Practices Act. Yes, this outrage is legal under Oregon law, since we have the weakest such law in the country. and litigate as is our right under federal law to protect the lands we all own. for our invaluable federal forests in western Oregon. matter how many times they are replanted and sprayed. by getting involved and TAKING ACTION! love and cherish. Encourage them to write and speak in defense of our forests and all they provide. First, involve yourself by learning about the O&C Lands and the issues surrounding them. alternatives being proposed to fund the O&C counties. you personally. Learn some more about those important issues you care about most. them effectively via letters, conversations, and other opportunities. in an adventurous journey into the life and impacts of a government land management bureaucracy. from a more informed place. Here's some issues to consider. recorded on Western Oregon BLM associated with recreation. Left: Air tanker after dropping retardant on the Cantrall Fire July 1987. View is from near Tunnel Ridge looking down through the mouth of the Little Applegate River Canyon. The little valley at Yale Creek lies under the thickest smoke. Right: Quartz Fire plumes up behind Trillium Mountain in 2001.
for forest fires of the future. stands prematurely drying out, fire hazards have increased dramatically over pre-treatment levels. lengths that it becomes unsafe to place fire crews near the fire. harvested is to employ an upper diameter limit on trees to be cut." habitat needs for interior forest species. exactly these forests 80-120 years old that the Timber Trust would clearcut. cut or roaded, would be clearcut under the O&C Trust legislation. We hear a lot about jobs and the necessity of providing jobs "in the woods" to "timber dependent"
based on natural resource extraction. bring income derived from dividends, interest, rent, and social security payments. Peer reviewed and in press in the Journal of Regional Analysis and Policy, 2013.
income growth in the last decade." valley communities in western Oregon? and start businesses, to retire and build a house, to invest in local communities. by helicopter, even though this practice was deemed illegal by the Supreme Court in 1984. · work in the forests became more focused on restoration than traditional logging. and equipment sales and service, markets/stores/restaurants, and more. participate in petition drives, public protests, and teach-ins. For specific communication ideas, please visit our Letter Writing Guide. Take Action! Letter Writing Guide Join and Donate to TELAV!